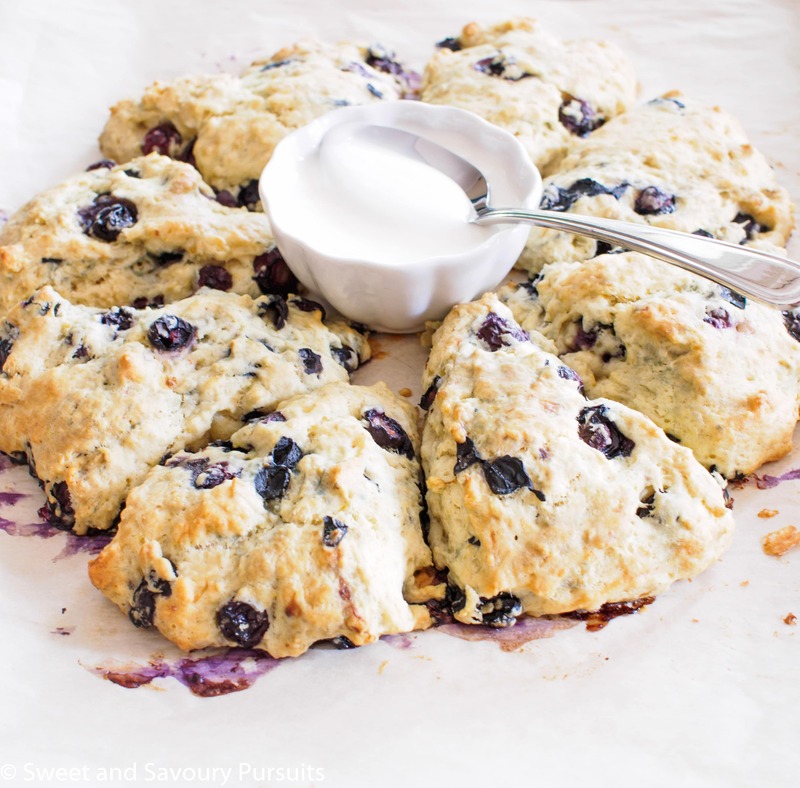 Tender, moist and lemony, these delicious fresh Blueberry and Lemon Scones make a perfect weekend treat for you and your loved ones! There is something about blueberries and lemon, they just go so well together, so when I came upon this recipe from the Pastry Affair blog, I just had to try it. This past month has been crazy busy, and I’ve really missed my mixer and oven. I’m so happy to have had a small break today so that I could make these incredibly delicious Blueberry and Lemon Scones. The recipe is from Pastry Affair and is simple and straightforward and I followed it pretty much as is except that since I had no heavy cream at home I used half and half. Because of this substitution the dough needed a bit more flour so I added about 4 tablespoons worth. The extra flour made it easier to work the dough into a circle and cut it into eight portions. 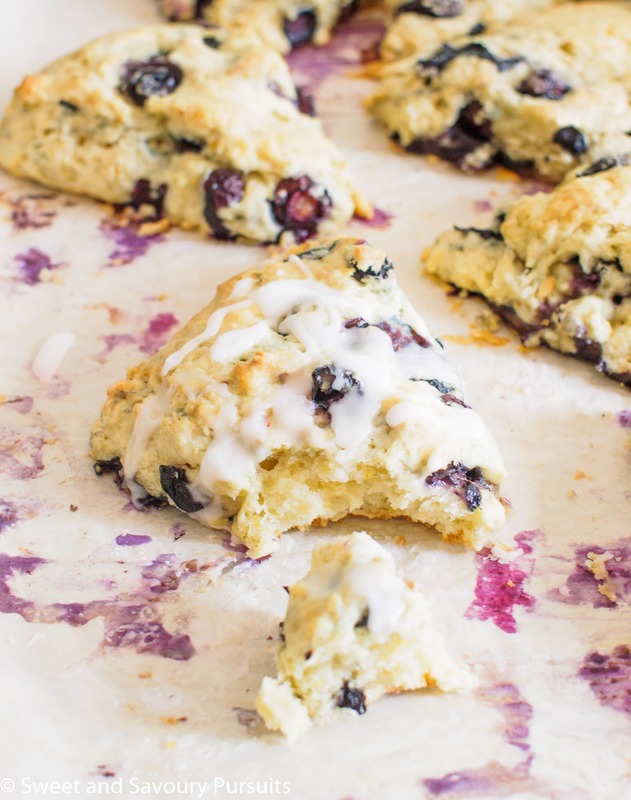 These Blueberry and Lemon Scones were tender, moist and lemony. They came out beautifully and were absolutely delicious. And since there is hardly any sugar at all in the scones I feel the lemon glaze is a must, though if you prefer things not so sweet then you could eat them on their own or maybe with some clotted cream. Put the flour, sugar, baking powder, salt and lemon zest in the bowl of your stand mixer, and with the mixer on low (fitted with the paddle attachment) combine the dry ingredients. Add in the cubed butter and mix until the pieces of butter are the size of peas. Whisk the egg into the cream and pour the mixture into the bowl with the rest of the ingredients, mix until the dough comes together and then add the blueberries. Do not over-mix or the blueberries will burst. Turn the dough out onto a lightly floured surface and using your hands shape the dough into a circle. Pat the dough so it’s about one inch thick. Cut into 8 even portions and place on lined baking sheet. Bake in the oven for 22 to 25 minutes until scones are lightly golden brown. Transfer scones to a wire rack to cool. While the scones are cooling you can prepare the glaze by whisking the powdered sugar, lemon juice and cream in a small bowl. Adjust the glaze to the desired consistency by adding more cream or milk. Nice scones, healthy and yummy! These look so amazing! I am so glad to have found your blog. You have amazing recipes and even amazing pics!! Thank you! They were really good 🙂 Thanks for stopping by! Such a delicious recipe you chose for your return to the kitchen! These look fabulous, Fida…simply scrumptious scones! I couldn’t agree more! My love for both blueberries and scones couldn’t meet a happier ending. Thanks so much! Everyone that tasted these scones loved them so much that I was asked to make another batch! Those look delicious! Bluberries and lemon, wonderful! Those are some very beautiful scones, love lemon and blueberry together and the scones look light and moist. Thank you for bringing these lovely treats to FF#20!! Your scones look perfect, they remind me of our local tea house that is known for their scones, a must try, pinned! Hi Lily, thank you so much for the lovely compliment and the pin! I love scones and these look gorgeous. Ah, scones! I could eat these all day and yours look amazing. Love the fresh fruit!!! Thanks Kloe! I know what you mean, that’s why I had one and put the rest in the freezer until I can give them away! Those scones look so good! These scones look delicious! Can’t wait to try one. I could use a few of these right now with my coffee! These look great! Oh yes, these are great with coffee 🙂 Thanks! These look great, Fida. I can tell how tender and moist they are from that last photo!